Gloucester 20 March 2017: ISD Solutions, the UK’s leading specialist subcontractor in the design and construction of composite panel, single envelope cold store warehouses, has won an A$12m order from Dutch cold chain logistics specialist NewCold, to build the company’s latest super-efficient freezer storage and distribution facility near Melbourne, Australia. This is ISD Solution’s first Australian cold store construction project and follows the creation of an Australian subsidiary earlier this year with the goal of introducing their acknowledged design and construction expertise with thermally efficient insulated PIR panels, to cold storage warehouse and distribution clients across the region. ISD Solutions have previously delivered several ‘’Single Envelope’’ high-bay freezer projects in the UK, in Gloucester, Wisbech, Dublin and Macclesfield. The contract involves the design and construction of the external single envelope for a 35m tall high-bay freezer operating at -25 degrees C and a detached 15m tall low-bay section. Together these will have a combined floor area of 19,000m2 and storage capacity for 100,000 Australian standard pallets. 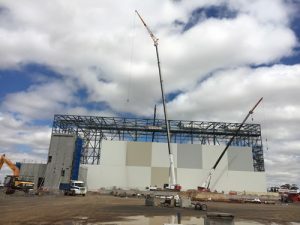 ISD expects to use some 60,000m2 of Kingspan CS panels during the build and once completed, mid-2017, the facility will be the largest automated high-bay freezer warehouse in the Southern hemisphere. The fast-expanding frozen and chilled food industry in Australia combined with growing demand for more thermally efficient, sustainable, chilled and frozen storage facilities globally makes single envelope construction and clad rack freezers using PIR insulated panels increasingly attractive. Significantly improved thermal performance compared to conventional construction materials and polystyrene based insulation is a key factor for the Australian market. High-bay single envelope solutions are also faster to build with a 20% saving on-site time, lower carbon and becoming more viable as land prices increase. The ability to operate with oxygen reduction fire safety technology partly as a result of the airtightness of the structure brings further benefits. The team are using BIM level 2 processes during the project to ensure seamless collaboration with the design team, structural engineers and lead contractor Hansen Yuncken Pty Ltd. This is particularly important for single envelope structures at this height where high tolerances for the structural steel supporting the composite panel envelope are crucial. ISD is sharing knowledge and expertise with the structural team and is responsible for load and fixing calculations for the envelope, all independently approved, to ensure long-term integrity and thermal performance of the envelope. High wind loadings in the Melbourne area have made this doubly important. The team is also advising on insulation and specific sequencing for the floor construction required for this type of building, as this is fundamental to forming an insulated envelope in its entirety where all interconnecting insulation junctions need to be continuous. Careful attention to detail is required around the dual purpose high-density timber blocks used, which act as a supporting foundation for the steel frame as well as an insulant and are integral to the floor design and insulation.